NETWORK FINALS: WORLD SERIES Game 3 adjusted to 3.9, well below 2016’s 5.2 for the parallel game. Elsewhere, MACGYVER and JANE THE VIRGIN gained 0.1 in final numbers. CABLE HIGHLIGHTS: Discovery’s GOLD RUSH led Friday cable, down 0.09 from last week to 0.68, with the season premiere of HOMESTEAD RESCUE as its 0.33 lead-out. A&E’s LIVE PD gained 0.04 to 0.56. ESPN’s COLLEGE FOOTBALL game was at 0.40. On HBO, REAL TIME WITH BILL MAHER dropped 0.07 to 0.36, and THE TRACEY ULLMAN SHOW was down 0.02 to 0.09. Nickelodeon’s 11AM PAW PATROL rose 0.09 to 0.35. 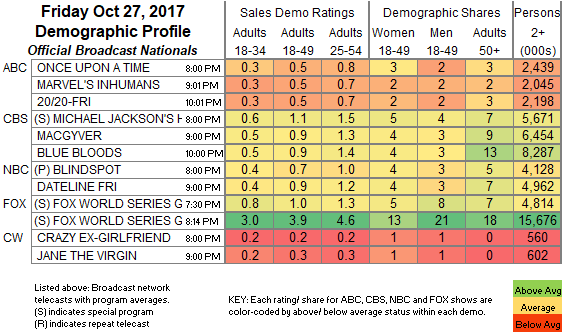 Disney Channel’s ANDI MACK was at 0.29. Fox News’s FOX & FRIENDS led cable news at 0.29/0.41/2.1M, over MSNBC’s RACHEL MADDOW SHOW at 0.28/0.39/2.3M, and CNN’s ANDERSON COOPER 360 at 0.19/0.26/900K. Cartoon Network’s 10-minute long TEEN TITANS GO ticked up to 0.29. On HGTV, HOUSE HUNTERS and HOUSE HUNTERS INTL were both at 0.23, respectively steady and up a tick. Bravo’s DON’T BE TARDY ticked up to 0.22. We’s MARRIAGE BOOT CAMP climbed 0.05 to 0.22. 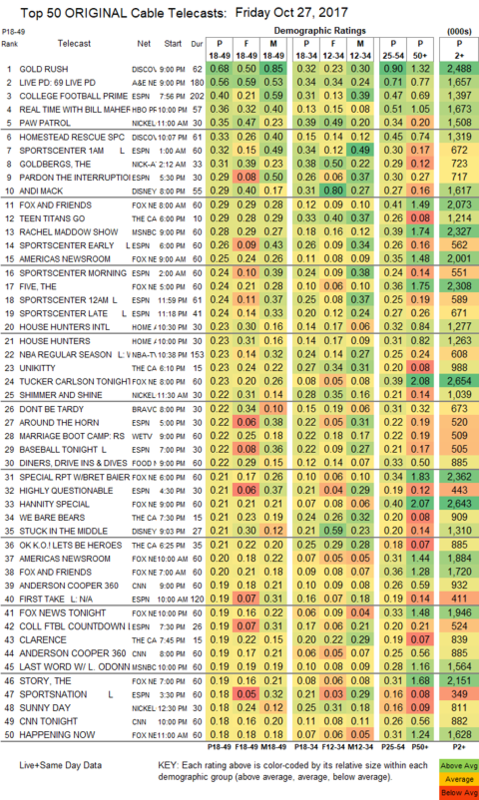 Food Network’s DINERS, DRIVE-INS & DIVES was at 0.22. On Syfy, Z NATION fell 0.05 to 0.16, and SUPERSTITION was down 0.04 to 0.08. On TLC, the season finale episodes of KINDRED SPIRITS were at 0.14/0.12, compared to last week’s 0.10, and EVIL THINGS was down 0.02 to 0.08. Lifetime’s MICHEL’LE: STILL STANDING SPECIAL was at 0.10.